Put it in park, Jeff Gordon and Jimmie Johnson. Our new fleet of tractor trailers can out-perform even these NASCAR heavyweights thanks to cutting-edge automatic transmissions that are…actually better for the environment? The innovative technology automatically shifts gears based on the truck’s fuel efficiency and power needs, meaning vehicles are running as efficiently as possible and drivers can stay focused on the road. We knew we needed to wave the green flag to more efficient vehicles, and this new fleet is significantly more high-tech and less gas-guzzling than the last (not to mention it reduces CO2 emissions by 11.4 percent, or 875 metric tons, per year). One of our must-haves was a fleet that would allow us to consistently obtain better fuel mileage. From the old fleet to the new, we’ve increased the mpg by 16 percent (a big deal for tractor trailers). It almost feels like we’re taking a victory lap here. Much of this fuel efficiency results from the automatic transmission, but additional contributors include improved aerodynamics (even on the mirrors) and aluminum wheels rather than steel (allowing the truck to carry 1,000 more pounds in every trailer and reducing the number of necessary trips). There’s also a small auxiliary power unit (APU) in each cab that allows it to be heated or cooled while the driver is resting without having to keep the main engine running. And on top of that, we participate in the U.S. Environmental Protection Agency SmartWay Program (run by the same EPA group as WaterSense). 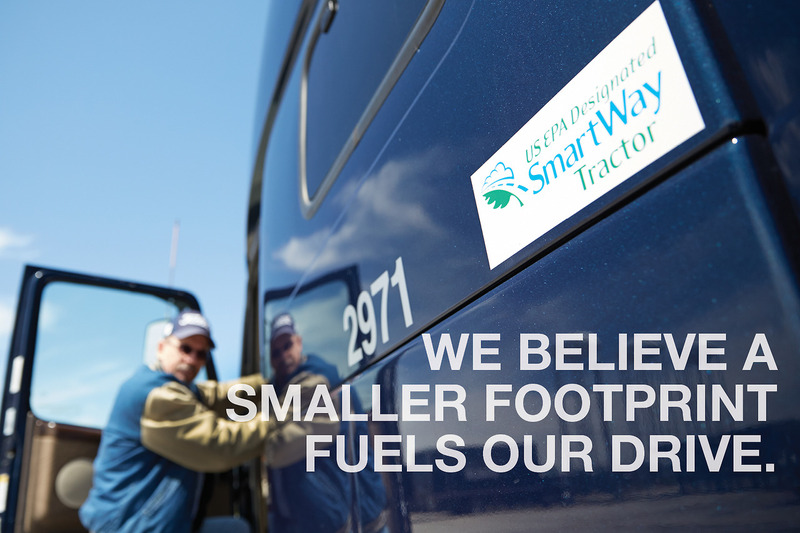 As SmartWay-certified shippers and carriers – and with the decals on our tractors to prove it – we can tangibly visualize our commitment to more fuel-efficient transportation methods. Ladies and gentlemen, we’ve never felt better about starting our engines.